I’m talking about how to avoid stuff shifting so you can make real decluttering progress. CanvasPeople.com is offering their popular 11 by 14 photo canvases for free this week only. You’ll pay nothing – just cover shipping and handling! To get your FREE canvas text SLOB to 48-48-48. This offer won’t last. Message and data rates may apply. Storyworth – StoryWorth makes it easy and fun for your loved ones to share their stories, with weekly emailed story prompts! For $20 off, visit storyworth.com/clean when you subscribe! Dana, I love your podcast. You keep explaining how my life works and why I do what I do around my home, which makes me feel sooo much better about my crazy self. I agree that linear de-cluttering may not be the best term for this process, though. For me it’s more about completing the process with one item, then looping back to the overall task at hand. Although I’m sure Loopy decluttering may not be the term you’re looking for, either! ;). Maybe tangental decluttering would work? I LOVED this! 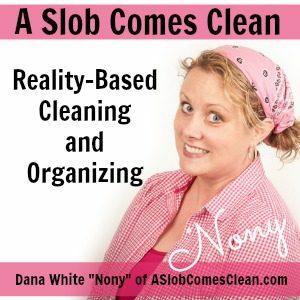 I am on the journey to NOT be a slob! lol! And Get rid of STUFF!!! My friend introduced me to your blog and this stuff-shifting podcast. I was very encouraged! You are REAL and (funny too). I am grateful for your tips, and this website. Looking forward to coming here for future tups & encouragement until I reach the goal of have a home of More Love and LESS STUFF! This podcast resonated with me so much! Your decluttering strategy of taking things to the place where you would look for them first RIGHT AWAY has been one of the biggest helps to me in my decluttering process over the past few years. What you describe here as “linear decluttering” is exactly what I have been thinking about – and telling my uninterested 10yo son followed by my only slightly more interested husband about – with great zeal. What I did: I managed to find the keys, got the files out of the safe, put them back in the drawer where I look for them first, filed the receipt, and put the keys back in their permanent home. What I did not do: I did not organize the drawer where they keys were found. I did not rethink where I keep these files. And, perhaps most importantly, I did not put that receipt in a pile of papers to deal with some day … er, year … as I always used to do. Because of your principles, I did not completely clear my dresser yesterday. But because of your principles, everything that has come off of that dresser is a task completed. No keep pile. No papers to be sorted pile. No put away later pile. Nothing has been stuff shifted except a small pile that requires my husband’s input. When I was listening to the podcast (while decluttering the dining room!) I thought that Linear Decluttering could also be called Chain Decluttering. First, a chain has several links (the tapes need to go in the tv cabinet, the photos need a container, the photos are contained, the tapes fit.) But a chain is also anchored to the original decluttering project – clearing the shelf. When I reach the end of the links, I go back to the anchor.